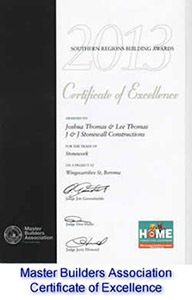 J&J Stonewall Constructions have been awarded a "Certificate of Excellence" for their imaginative and environmentally sustainable use of stone. 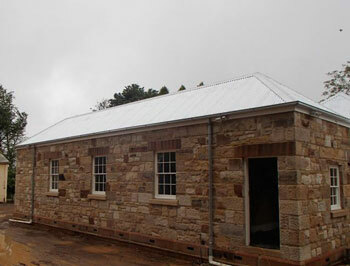 The award specifically recognised the company's work at a client's property in the Southern Highlands town of Berrima, NSW where the company made use of sandstone originally quarried by convicts for the stone foundations of the wrought iron fence around Centennial Park in Sydney. When work at the park was carried out in 2012 new foundations were constructed resulting in the original sandstone being obtained by J&J. 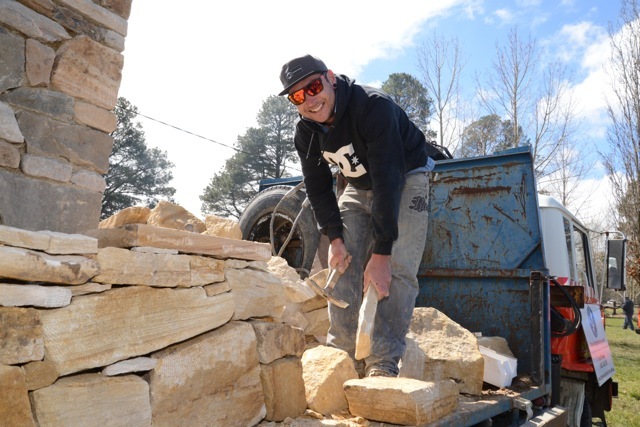 Over several weeks of intensive work the sandstone was carefully cut up into 130mm thick 300mm course height blocks. 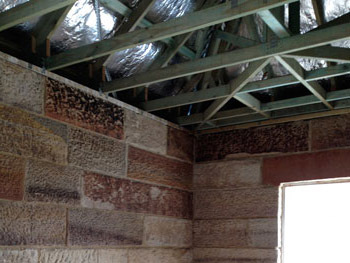 With L-Shaped corner blocks and solid lintel stones, the internal walls were "Ashlar" in style with a 300mm course height 130mm thick which was then tied to the outer wall, constructed using a 300mm coursed rubble construction, 130mm with plinth and L-Shaped coins to keep a 50mm cavity. 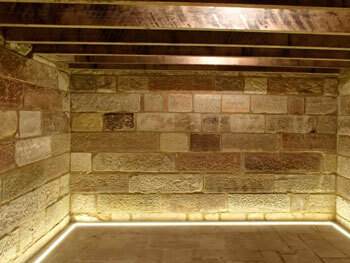 The result is a very old looking wall with the benefits of modern construction techniques. 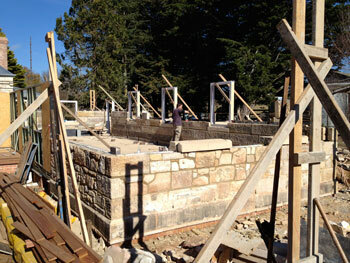 These images show the work at various stages in the construction. We recently participated in the first regional Home & Garden Show held in Bowral at the Bong Bong racecourse on September 6th and 7th. Our employee Julian Frankie, pictured here on our recently purchased and very useful ex-firetruck, captured the attention of visitors. Because of the recent rains it proved too difficult to get the truck and its load of stone down into the main exhibition area so we had to park it near the main entrance. Having a display at the entrance as well as in the exhibitors' area was an unexpected bonus for us! We've purchased new stone splitting and cuffing machinery allowing us to take large slabs of stone and make wall cladding, paving, pillar caps, copping courses, step stones, window sills, lintels, stone hearths mantles and plinths from a range of local stone with deals with local quarries. We should be able to supply sandstone from two separate quarries, onex limestone and something and hope to run a stone supply business to complement the stonemasonary company. We’ve recently built a new machinery shed to house all our tools and a growing list of machines which now include a fork-lift, hydraulic splitter and saw with a four-wheel drive tipper with Hyobe. 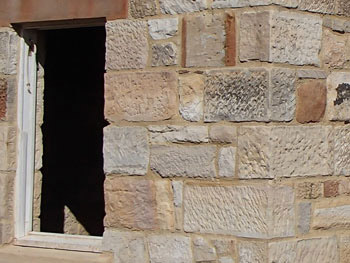 Recent projects we have completed include a stone house at Sutton Forest where we had to restore the old house by repointing and relaying some walls and build a new extension using convict cut sandstone blocks and rubble. We built a 300mm thick double sided wall with a 50mm internal cavity with plynth courses and all large solid sills and lentils - we've also completed four entrance ways pillars and caps already this year and a basalt dry stone something clad on a parapet wall surrounding a home extension coming up. We have an entrance way to build out of a new stone product being iron stone from Penrose. It shouldd make a dark brown wall with long bonding stone with a book leaf look about it, but with large substantial stones. 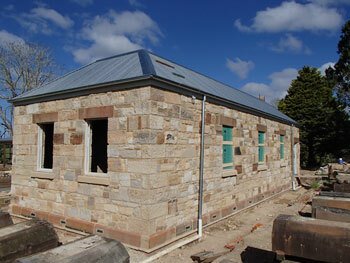 We also have another house to clad in sandstone, a dry stone effect look with a challa feel to a large new home in the Moss Vale area. We also have three or four places on the books to be started soon from the top.